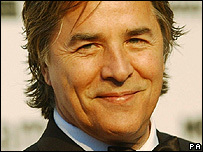 Miami Vice star Don Johnson is to join the West End cast of Guys and Dolls. The 56-year-old actor will appear in the role of Nathan Detroit - which was made famous by Frank Sinatra in the 1955 film - from January. Dirty Dancing star Patrick Swayze, who is currently playing the character, finishes his run on 4 December. Johnson started his career in musical theatre but found fame on the 1980s cop show Miami Vice. He later starred in the detective drama Nash Bridges. The actor also launched a pop career at the height of his Miami Vice fame and scored a top 10 hit in the US with the single Heartbeat. He was twice married to actress Melanie Griffiths, with whom he had a daughter, Dakota. Johnson has also had three children with his current wife, Kelley Phleger, and a son by actress Patti D'Arbanville. During the gap between Swayze leaving and Johnson starting, the role of Nathan Detroit will be filled by Alex Ferns, better known as EastEnders villain Trevor Morgan. After appearing in the West End show, Ferns will join the UK touring production of Guys and Dolls in Sunderland and Milton Keynes.